Travelling, especially for an extended period of time, can be difficult. It is too easy to slip into periods of time where you let things that are important to you fall to the wayside. One of the first things to go is your normal exercise routine, followed by cooking, and even spending time with your children and pets. Whether you’re in Plano looking for a job or visiting friends or family, it’s important to establish or stick to the routine that makes you happy and productive. Luckily, at Studio 6, we make it easy for you to do all of the things you do at home in our comfortable and clean extended-stay hotel. Read on to learn about how we make travelling easier, then give us a call to book a room! Trying new restaurants and spending time out in a new town is one of the best parts about travelling. However, when you’re staying somewhere for more than just a few days, the lack of a dining routine and constantly eating at restaurants can begin to feel less and less fun. You might notice your wallet getting lighter and your pants getting tighter, too. All of our rooms feature full kitchenettes, so you can watch what you eat and save a lot of money in the process. There’s nothing like making one of your favorite meals and relaxing in your own space to make you feel like you’re at home. Enjoy a hot cup of coffee every morning thanks to the coffee maker in every room! Sometimes the best part of our vacations are our vacations from our workouts. While we all want to look great and feel spectacular, hitting the gym isn’t always a party you look forward to attending. The problem with taking time off from exercising is that it is always that much harder to get back to it once you’ve stopped for more than a few days. While we aren’t saying that you should spend your entire trip working out as your normally do, don’t forget that exercise is a great way to reduce stress and to help you sleep better. This is a good thing to keep in mind if you’re in Plano looking for a job or if you’re doing something that isn’t especially fun or exciting. Our fitness center is a great way for you to keep working out while you’re on the road. We have clean equipment that works as hard as you do. Because the fitness center feels like a real gym, it will quickly become a part of your routine while you’re staying in our hotel. Our spacious rooms are also big enough for you to do yoga in them! Spend Quality Time With Your Kids and Pets! 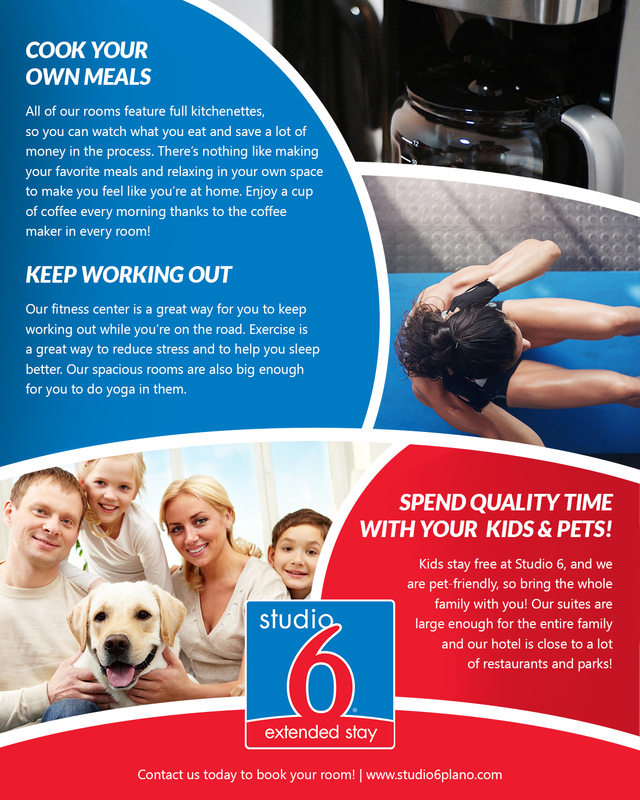 Kids stay free at Studio 6, and we are pet-friendly, so bring the whole family with you! Our suites are large enough for the entire family, and our hotel is close to a lot of restaurants and parks! Browse our site to see pictures of our rooms and suites, then contact us today to book your room!